There's a hot new Charizard Tech out, Look out big Leff! leffen saw that as he was scrolling through reddit on stream a couple nights ago and gave the most sarcastic "oh yeah charizard is top tier" ever, then kept scrolling. These are two pretty small changes but they would open up Pit to have the punish game he needs in order to be top tier. Against most of the cast, you would be able to do dtilt->jablock->dtilt from low % (starts around 3 on most characters, ends around 40) and then dtilt->utilt->dragdown uair->dtilt loop until around 80-90. And I think comparatively this would actually be really balanced, this chain takes up a lot of horizontal space, so to get the full 80-90 damage you would need a long distance with no platform interruption, so you would basically have to start on one corner of FD and work your way to the other. It also doesn't end in a kill move, so it's not nearly as crazy as Peach's combos currently while being more difficult, and it breaks if there are platforms. And I haven't tested yet, but I have a suspicion that you might be able to SDI out of uair the same way you can SDI out of lightning loops. I was testing these combos in training mode, and you can ALMOST do all of it, your opponent just has a tiny window to escape, and with the way that the buffer system works, that means they actually have a huge window to escape. Update: I'm 2 for 2 on putting the character that wins a major at the top of a tier list. I started putting Lucina number one and Leo won Genesis. I started putting Olimar number one and Shuton won Prime Saga (which was technically a regional but it was stacked like a supermajor). I don't 100% agree with this old list anymore, but it's not far off. I made this list recently for a different conversation and I think it's probably my final list for 2.0. Only thing I might change is moving Roy down from A+ to A. But basically I split each tier into 3 subtiers. The gap between subtiers is super super small, and the gap between characters in the same subtier is so small that it isn't worth debating. Characters on the same line might as well be tied. I put them in the order that seems right to me, but if somebody wanted to argue that, say, Shulk > Marth, I wouldn't bother having that argument. It doesn't matter at that level of detail. S is true top tier, and easily capable of winning a supermajor. A is high tier, easily capable of making top 8 at a supermajor. Winning a supermajor isn't out of question, but they aren't fully optimal. B is upper mid tier, where it's entirely plausible to make it to top 128 or top 64 of a supermajor, but beyond that the character really starts to fall apart. C is lower mid tier, where the character isn't as good as a top tier but is still capable of producing some results if played extremely well. D is low tier. Even on lower levels the characters have flaws that start to come out. Breaking a pool at a supermajor is probably about the limit of success for any of these. F is garbage. Characters that need significant buffs in order to play at a competitive level. The characters I'm interested in playing rn are Pit, Pika, Palu, and Inkling. The problem with Pit is that even though he's underrated, he's definitely not top tier still. So do I grind it out with Pit and get non-top-tier results, or drop him for a better character?? Who knows. 3.0 and Joker Dropped, was 100% expecting a giant wall of text from Krev... You let me down man. lol. joker feels like a mix of s4 sheik and cloud. might main. All Fighters Basic Movement Perfect shields will no longer activate multiple times when the shield button is released once. This was creating more downtime than a single perfect shield. All Fighters Basic Movement Made it easier to be penalized for continuous dodging. All Fighters Basic Movement Shortened the downtime when performing a perfect shield against projectiles. Hot Damn, the first patch notes are nice. Another great patch update, a few things lacking, but overall it looks really good. A lot of buffs and a few nerfs where needed, nice to see it not just be increased knock back range etc as well. Holy Shield Damage nerfs lol! 1. Jab is the jab I've wanted this whole time. It's a jab that can actually frame trap, which was my favorite part about Sheik in S4 and has been completely absent from the entire cast in Ult. 2. Uair is Sheik's S4 uair but better. It lasts even longer, and Joker's fast fall is HELLA fast, so you can use it for drag down combos, or as a juggling tool. It can also bully through platforms, but one of the big things is that drag down uair can lead to a grab. On fastfallers, you can chaingrab with it a little bit. This seems like it's the best tool in his kit currently. 3. Nair is super safe on shield and can sorta start combos. Spaced bair and spaced fair seem hard to punish but I'm not sure the frame data. But the important thing is he's really good at dealing with shields. 4. Bair is another really really good tool. The hitbox comes out on frame 7-8 and it's got really low landing lag (pretty sure it autocancels hella early??) so you can use it as a zoning tool against non-sword characters. 5. Dtilt is an amazing combo starter that's pretty reliable in neutral. It's a slide, really similar to Cloud's dtilt. There's a pretty big window where it combos into utilt, and after that window it starts comboing into uair, so you can almost always get something off of it. The B&B combo that people already seem to be doing is dtilt->utilt->uair at low damage, and you can potentially drag down uair into something else, depending on % and the opponent's character. 6. Utilt has one of the coolest animations in the game. It's also, like, a good tool because it combos at low damage and kills at high damage. 7. Gun seems like it will be a really cool tool for movement. I need to practice wavebouncing, because I feel like Joker being able to wavebounce gun into gun dodge will help his air movement a ton. I know M2K was talking about how Salem had already picked up on using gun dodge to help with recovery mixups. I don't actually see gun being a very good move other than movement, though. Gun down seems like it might be a useful edgeguarding tool against characters that are recovering low (K Rool) but it's a slow startup and Joker falls so fast that he can't keep it out very long. So idk. This might be a useless move tbh. 8. I don't really like his side B. It shoots a small shot in a similar trajectory to Elfire, and the shot does about 3 initial damage and poisons the opponent, dealing about 10 lingering damage over the next few seconds. It's mostly just useful if you're playing defensively. The damage output is pretty mediocre, unless you have Arsene. 9. Down B is kinda like Revenge, but instead of getting a huge boost to your next attack, you get a big boost on your Arsene meter. Arsene isn't what I expected - It's not quite as OP of a buff as I had expected, but it comes out so much more frequently than I thought it would, so overall it's still a really useful mechanic. Arsene protects your back from some moves, and I'm interested in learning more about that. Zero also noticed on stream last night that there were times when Joker was inactionable but Arsene could still do things, so there might be ways to desync Arsene. 10. The grapple is a lot better than I expected. It's not amazing, and his recovery is still probably his biggest weakness, but he has easily the longest grapple recovery in the game. It's also really practical as an offensive tool. You can use it while ledge trapping to cover jumping from ledge, you can use it to punish defensive characters for platform camping, and you can use it in conjunction with uair juggles to really push your vertical combos. All in all, this character seems really strong. It's too early to really pin down where he'll settle into the meta, but I definitely see him being in the upper side of the tier list. I need to see how certain matchups play out and all that, but he definitely has the toolkit to be, at the very least, solo main viable, if not top tier. We'll have to see how it all plays out, though. THERE'S MY WALL OF TEXT! good Read, and about what I've been reading most elsewhere, feels like s4 shiek and cloud mashed with some added flair (chemical x?) One of my friends has called dibs on him, so I won't be maining him, but I'll be good with my Cloud/Tink Dual Mains I think. Apparently Leffen found/showcased a 187 hit combo with Joker? It just hit my newsfeed on youtube. It seems like you can buffer shield but it's a forced hard landing as it drags down so you can't tech it at all. So you can't buffer shield out of the Leffobble if it's done frame perfect, but you can SDI out of it so it's not a real infinite. But SDIing out of it puts you in the worst possible positioning against Joker. Anyways, after putting in ~10 hours of Joker labtime, I've realized that I don't want to main this character. He doesn't get nearly as much room for creativity in neutral, and despite having amazing punishes that might put him in top tier, it feels like he just doesn't have the toolkit to deal with every situation. 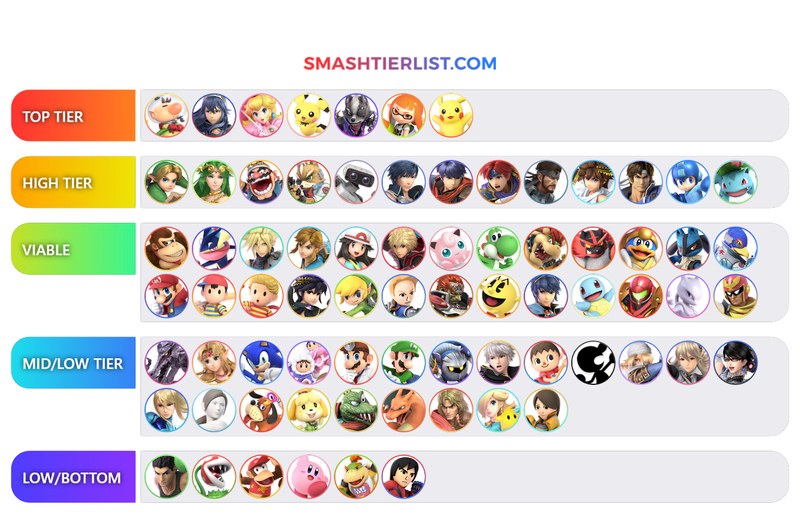 I think Joker is gonna be one of those characters where a small handful of high level players will do really really well with him, enough so that people might consider him top tier, but mid level players will get stuck by his alarming flaws, and so you'll see Joker mains exclusively making top 32 at majors or drowning in pools, with almost nothing in between. Anyways, I'm sticking with Pit. At top top level, I can see Joker potentially being better than Pit, but at the level I'm currently playing, and at any level I can expect to be in the forseeable future, Pit is DEFINITELY a better pick. I went 0-2 at a tournament today btw. Feelsbadman. Really the big takeaway is that I shouldn't be competing again until after graduation. I already don't really have the time to dedicate to being good at this game, and the little time that I have been spending over the past few days has been spent learning Joker, which definitely had a negative impact on my Pit. Round 1 I played against a Pika and that's straight up Pit's worst matchup. Game 1 was going okay, but I was behind by about a half stock for the whole game, and then I SD'd at the end because I went for a side B but somehow buffered it into an up B off the stage!? Game 2 I switched to Lucina because I knew Pit wasn't gonna win me the next game. Problem is, I haven't touched Lucina in like a month, so it took a little while to get warmed up with her. By the time I started playing good, I was down two stocks and a little bit of damage. I was really close to getting the reverse 3-stock, but I missed an input on a fsmash read that I definitely had, then later I committed to a bad roll from the ledge and lost the game for it. But I think if I keep practicing Pit and Lucina as a secondary for the couple of matchups Pit loses, I'll be fine. Round 2 I played against a Bowser, and I was bodying him game 1, but game 2 he was having controller problems and paused the match to swap to a new controller, and of course this dude was using Joycons so it was a whole long process of going into the home menu, reconnecting everything, then having to reassign controllers because somehow he took over as me, and the whole thing completely crushed my momentum and I went on to lose that game, which really tiled me, and going into game 3 I was thinking "okay, I'm tilted, I'm gonna just switch to Palu because Palu destroys heavies and I just wanna get this over with" which was a HUGE MISTAKE!! Playing Palu when your tilted is terrible!!! Everything seems so slow!!! You get punished for everything!!! I fucked up!!!! He three stocked my Palu!!!! I almost threw my controller, it was awful. I ended up chilling in the parking lot for like 15-20 minutes after because I was too angry to drive home. Everything else is fine, I don't think any other matchup is worse than like 45:55, with most being even or better. So like. Yeah. If I wanted to pick up a secondary exclusively for Pika, it would be Olimar or Ness, since those are the only characters that everyone seems to agree beat Pika, but I don't enjoy playing Ness and I feel like if I were to learn Olimar it would make sense to just main Olimar. Lucina is pretty much even against Pika, maybe a slight advantage, while also being even or better against Pichu, Ike, Cloud, Roy, Yink, and Wario, so if I'm ever in a rough spot against a character that isn't Inkling, Lucina is a good pocket secondary. Back to Super Smash Bros.